The Broad Stage presents Manual Cinema’s Mementos Mori – a dynamic, beguiling meditation on death and dying. A cast of six puppeteers use hundreds of paper puppets, seven overhead projectors, two cameras and three screens to create a live “movie” in front of the audience. Mementos Mori has three performances only April 12 and 13 at 7:30pm and April 14 at 2:00pm. Tickets, starting at $35, are on sale at www.thebroadstage.org or by calling 310-434-3200. Mementos Mori premiered in 2015 at the Museum of Contemporary Art as part of the Chicago International Puppetry Festival. Manual Cinema is a performance collective, design studio, and film/ video production company founded in 2010 by Drew Dir, Sarah Fornace, Ben Kauffman, Julia Miller, and Kyle Vegter. Manual Cinema combines handmade shadow puppetry, cinematic techniques, and innovative sound and music to create immersive visual stories for stage and screen. Using vintage overhead projectors, multiple screens, puppets, actors, live feed cameras, multi-channel sound design, and a live music ensemble, Manual Cinema transforms the experience of attending the cinema and imbues it with liveness, ingenuity, and theatricality. 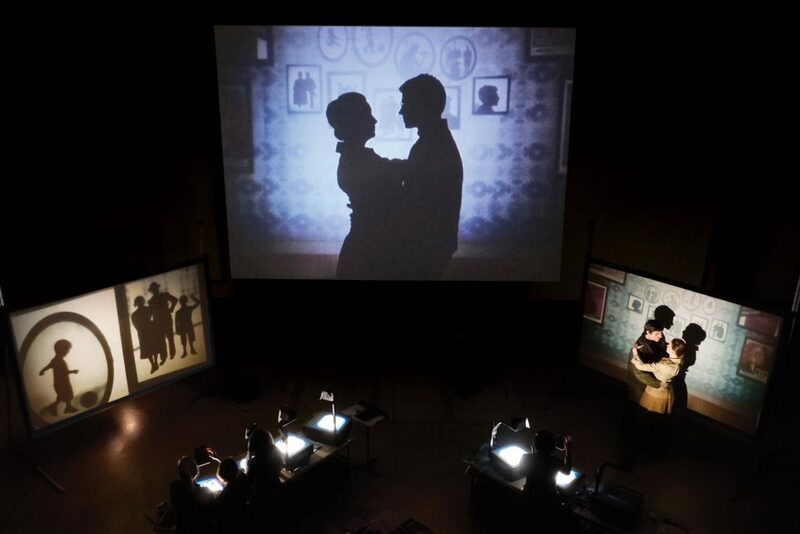 To date Manual Cinema has created ten feature length live cinematic shadow puppet shows (Lula Del Ray, ADA/ AVA, Mementos Mori, My Soul’s Shadow, The Magic City, The End of TV, No Blue Memories: The Life of Gwendolyn Brooks, and Frankenstein); a live cinematic contemporary dance show created for family audiences in collaboration with Hubbard Street Dance and the choreographer Robyn Mineko Williams (Mariko’s Magical Mix); an original site-specific installations (La Celestina); an original adaptation of Hansel & Gretel created for the Belgian Royal Opera; music videos for Sony Masterworks, Gabriel Kahane, three time GRAMMY Award-winning eighth blackbird, and NYTimes Best Selling author Reif Larson; a live non-fiction piece for Pop-Up Magazine; a self-produced short film (CHICAGOLAND); a museum exhibit created in collaboration with the Chicago History Museum (The Secret Lives of Objects ) a collection of cinematic shorts in collaboration with poet Zachary Schomburg and string quartet Chicago Q Ensemble (FJORDS ); live cinematic puppet adaptations of StoryCorps stories (Show & Tell) and NPR’s Invisibilia. Manual Cinema also collaborated with The New York times to create puppet animation and an original score for The Forger, an Emmy Award-winning and Peabody Award-nominated documentary short. Manual Cinema has been presented by, worked in collaboration with, or brought its work to The Metropolitan Museum of Art (NYC), The Tehran International Puppet Festival (Iran), La Monnaie-De Munt (Brussels), BAM (NYC), Underbelly (UK), Adelaide Festival (AU), The Kennedy Center (DC), The Kimmel Center (Philadelphia), the Museum of Contemporary Art Chicago, the Noorderzon Festival (Netherlands), The O, Miami Poetry Festival, Davies Symphony Hall (SF), The Ace Hotel Theater (LA), Handmade Worlds Puppet Festival (Minneapolis), The Screenwriters’ Colony in Nantucket, The Detroit Institute of Art, The Future of Storytelling Conference (NYC), the NYC Fringe Festival, Arts Emerson, The Poetry Foundation (Chicago), the Chicago International Music and Movies Festival, the Puppeteers of America: Puppet Festival (R)evolution, The Public Theatre’s Under the Radar Festival (NYC), and elsewhere around the world. Manual Cinema was ensemble-in-residence at the University of Chicago in the Theater and Performance Studies program in the fall of 2012, where they taught as adjunct faculty. They were an ensemble in residence at University of Colorado, Colorado Springs in partnership with the Public Theatre in winter 2019. They lead the Catapult: Professional Training Workshop with the Chicago International Puppetry Festival and the Poetry Foundation during spring 2018. Manual Cinema has taught workshops at the School of the Art Institute Chicago, The Future of Storytelling Conference (NYC), Stanford University, Yale University, Puppeteers of America: Puppet Festival (R)evolution, the Chicago Parks District, and many other theaters and universities around the country. The company offers extensive workshops and education opportunities as part of its touring engagements. In 2019, the company begins pre-production on their first animated short film and will have the U.S. premiere of Hansel and Gretel with the Oregon Symphony. 1310 11th St. Santa Monica CA 90401. Editors please note when referring to our venue, we are appropriately The Broad Stage (three words) and we are located in Santa Monica, California. The Broad (two words) refers to the contemporary art museum on Grand Avenue in downtown Los Angeles. DREW DIR is a writer, director, and puppet designer. Previously, he served as the Resident Dramaturg of Court Theatre and a lecturer in theater and performance studies at the University of Chicago. He holds a master’s degree in Text and Performance Studies from King’s College London and the Royal Academy of Dramatic Art. SARAH FORNACE is a director, puppeteer, choreographer, and narrative designer based in Chicago. She is a co-Artistic Director of Manual Cinema. Outside of Manual Cinema, Sarah has worked as a performer or choreographer with Redmoon Theatre, Lookingglass Theatre Company, Court Theatre, Steppenwolf Garage, and Blair Thomas and Co. Most recently, Sarah wrote the story mode for the video game Rivals of Aether. In 2017, she directed and edited the first episode of the web series, The Doula is IN. In 2016, she directed and devised an “animotion” production of Shakespeare’s Hamlet with Rokoko Studios for HamletScen at Kromborg Castle in Elsinore, Denmark. BEN KAUFFMAN is a composer, director and interactive media artist. His most recent work has been exhibited at The Peggy Notebaert Nature Museum in Chicago, CUNY’s Baruch College, and he has lectured and given workshops at The Metropolitan Museum of Art, New York University, Baruch College, and Parsons the New School of Design. He holds a Master’s degree from New York University’s Interactive Telecommunications Program (ITP). JULIA VanArsdale MILLER is a director, puppeteer, and puppet designer. With Manual Cinema she has directed Mementos Mori and The End of TV as well as created original roles in Ada/Ava (Ada), Lula del Ray (Lula’s Mother), The Magic City (Helen), and Hansel und Gretel (Hansel). In Chicago she has worked as a performer and puppeteer with Redmoon Theatre and Blair Thomas and Co. She spent several years training in devised theatre, clown and mask with Double Edge Theatre, Carlos García Estevez and at the Academia dell’Arte in Arezzo, Italy. She is a co-producer of the new web series The Doula is IN, and has directed and edited several episodes. KYLE VEGTER is a composer, producer, sound designer, and Managing Artistic Director of Manual Cinema. As a composer he’s been commissioned by such groups as TIGUE, The Chicago Symphony Orchestra’s MusicNOW series, the Chicago Composer’s Orchestra, the New York Times, and NPR’s Invisibilia. His production credits span genres, and include recent releases by Thin Hymns, Spektral Quartet, Tim Munro (of eighth blackbird), and Color Card. His past Composer/ Sound Designer credits with Manual Cinema include Lula Del Ray, Ada/ Ava, FJORDS, The End of TV and various other performance and video projects. He has been an artist in residence at High Concept Laboratories, and co-founded Chicago’s only contemporary classical music cassette label Parlour Tapes+. The Eli and Edythe Broad Stage at the Santa Monica College Performing Arts Center opened its doors in October 2008. The Broad Stage is an artist’s dream and an audience’s delight. Unlike any performance space in the country, it is sublimely intimate with just over 500 seats and strikingly grand at the same time–allowing eye contact with artists from the boxes to the back row–forging a new kind of artist and audience experience in Los Angeles. 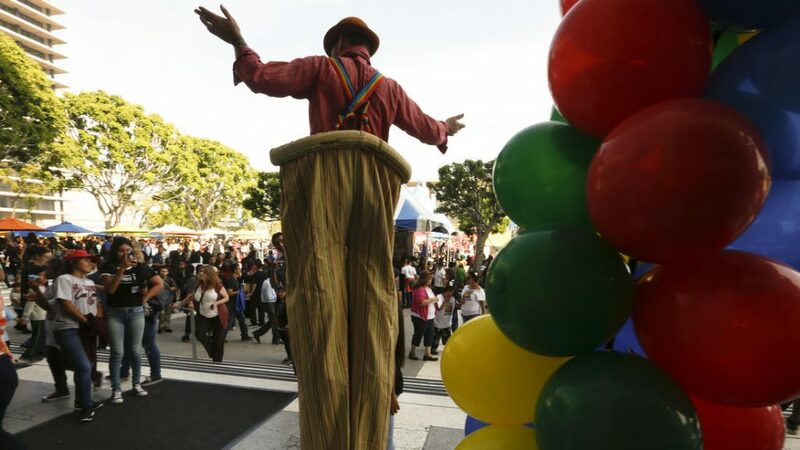 Boasting one of the city’s largest proscenium stages, The Broad Stage offers theatre, dance, film, opera, jazz, world music, musicals, symphony and chamber orchestras, family programming and more. Each genre features superlative talent from every generation and around the globe. No other performing arts center west of the 405 can boast such consistently stellar lineups of performers, including André Watts, Anna Netrebko, Sir James Galway, Sutton Foster, Preservation Hall Jazz Band, Mikhail Baryshnikov, Patti LuPone, Aaron Neville, Lee Ritenou, Dave Grusin, Joshua Redman, Lil Buck, Bobby McFerrin, Helen Hunt, Academy of St Martin in the Fields and many others. In addition to The Broad Stage, The Edye, our 100-seat black box theater, presents new, developing and innovative work in theatre, music and dance as part of our Under the Radar Series, as well as offerings from our other genres. Featuring younger, emerging artists, chamber pieces and plays, programming at The Edye reflects the dynamic nature of the space and allows for the latest, most exciting artists to be booked on short notice. The Broad Stage’s Education and Community Programs offer opportunities for cultural exposure through various student events, currently reaching more than 20,000 children, parents, educators and community members every year.